How to fill in missing value of the mean of the other columns? 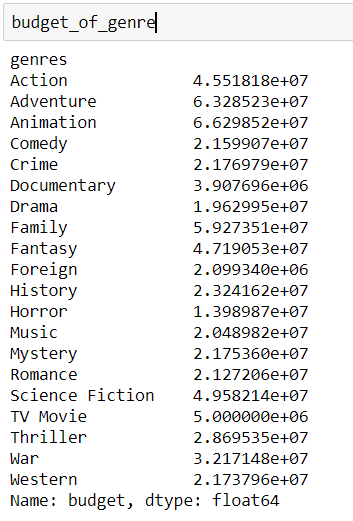 I had a movie dataset including 'budget' and 'genres' attributes. I'd like to fill in the missing value of budget with the mean budget of each genre. I first create two dataframes with or without budget. Then, calculate the mean budget of each genre based on the BudgetNotNull dataset. Finally, I'd like to fill in the budget of BudgetNull based on its genre. 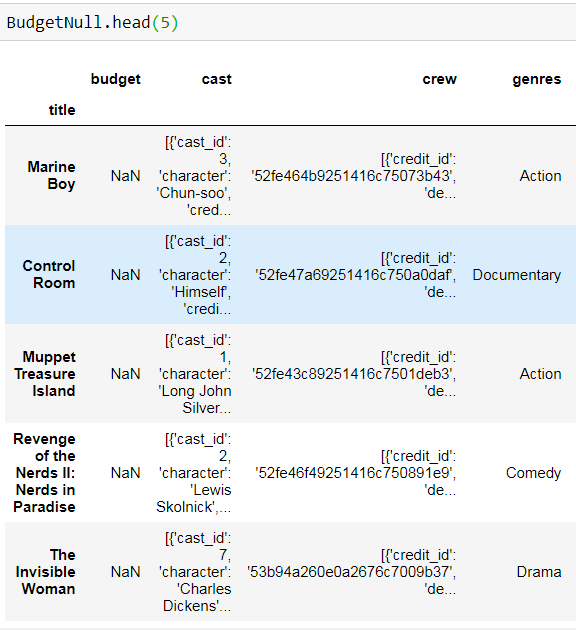 For instance, 'Marine Boy' is a action movie, therefore, fill in budget_of_genre['Action']. How do I do this via for loop? Or there's other ways? The mean calculation uses only the non-null values in its calculation. So the mean of each group's non-null values are imputed to that same group's null values. See also this question on Stack Overflow. Not the answer you're looking for? Browse other questions tagged python pandas data-cleaning missing-data or ask your own question. How to model this variable? How to fill missing value based on other columns in Pandas dataframe?